Overview: Four complete strangers, each an expert in his chosen field, are brought together after walking away unharmed from what should have been a fatal plane crash. Realizing that they are now living on borrowed time, the four men – Rocky Davis, Olympic wrestling champion; Prof Haley, master skin diver; Red Ryan, circus daredevil; and Ace Morgan, war hero and fearless jet pilot – don matching purple outfits and ban together to form the Challengers of the Unknown. After four appearances in Showcase over a one year period, the Challengers moved over into their own bi-monthly title. Most issues featured two stories – one featuring the four original “Challs” (as they often were referred to as) and one featuring them with the honorary girl Challenger, June Robbins. The Challengers took on a variety of cases which brought them face-to-face with killer robots, alien races, and oversized animals. While most of their opponents were one-and-done, one long-time DC Universe villain makes his appearance in this volume: Multi-Man debuts in #14, and returns many times over, with a new power developing after each resurrection following his death. Why should these stories be Showcased? : The Silver Age DC stories are difficult to recommend compared to the modern comics of today, and even against the Silver Age Marvel stories. For the most part, these stories are very forgettable once you close this book. The one reason I see to pick up this book is for the groundwork that Jack Kirby put in developing his story-telling techniques. While most issues have a writing credit, researchers believe that Kirby was doing most of the writing/story-telling himself on this title. Kirby re-used much of his work here when he helped create the Fantastic Four for Marvel with Stan Lee: the matching uniforms; the character designs for Reed Richards (Prof Haley), Johnny Storm (Red Ryan), and Ben Grimm (Rocky Davis); and a team surviving a crash that unites them with a common purpose. Read this if you are a Kirby fan; otherwise, look for a different challenge. Footnotes: Showcase #6, #7, #11, and #12 are also reprinted in Showcase Presents Showcase Vol. 1. If you like this volume, try: the eight-issue 1991 Challengers of the Unknown series by Jeph Loeb and Time Sale. 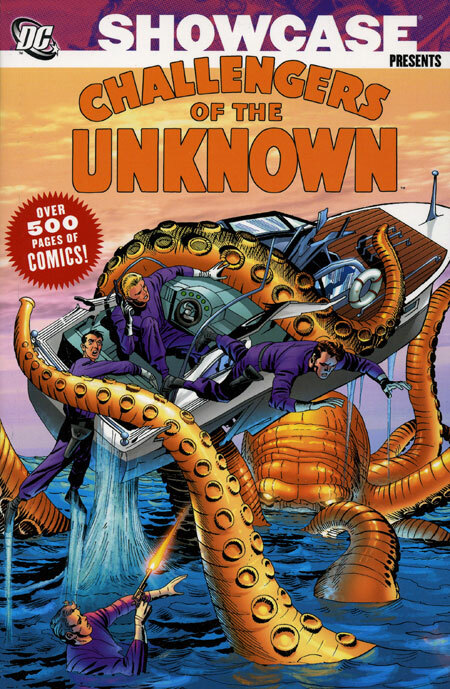 When it was collected as a trade paperback, it was titled Challengers of the Unknown Must Die! This was the first comic story by Loeb, who had spent many years as a Hollywood screenwriter. This series is also the first of numerous pairings of Loeb and Sale, who would team up for award-winning works such as Batman: The Long Halloween, Superman: For All Seasons, and Spider-Man: Blue. Loeb stays true to the Challs origins while freshening up the concept for a modern audience. Sale’s art looks simple on the surface, but is very complex and breathes new life into this 1950s concept. This entry was posted in Challengers of the Unknown, DC Showcase Presents and tagged Challengers of the Unknown, Jack Kirby. Bookmark the permalink. Pingback: Throwback Thursday – Showcase Presents Challengers of the Unknown Vol. 1 – WORST. COMIC. PODCAST. EVER! Pingback: Throwback Thursday – Showcase Presents Challengers of the Unknown Vol. 2 – WORST. COMIC. PODCAST. EVER!